Fenderâ€™s iconic Telecaster has many submodels to its name, which have their own distinct set of players. These include the Thinline semi-hollow model, the Custom with a humbucker at the neck and a different scratchplate, and the Deluxe, with two humbuckers and a wide headstock reminiscent of the 1970s Stratocasters. The Elite concept was an ambitious project to combine tradition with modern (at the time) technologies with more user-friendly hardware, upgraded electronics and better neck adjustment. The intention was to produce an upgraded version of a classic with a more modern look and feel, and to hopefully entice some Gibson players into the Fender family. It was designed as a loud rock-orientated instrument, with 2 humbuckers, four knobs as opposed to the usual two,a three way toggle switch and white binding on the top body edge. The Elite had new pickups and active circuitry, with MDX and TBX controls, a biflex truss rod and a new heavy duty cast bridge, not usually seen on Telecasters. 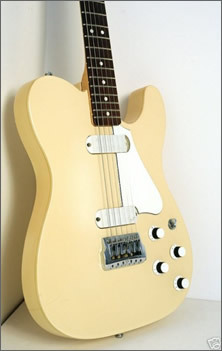 According to several reviews on Harmony Central.com the guitar has a heavy ash body and the usual bolt-on maple neck. The Walnut Elite, made with American black Walnut body and neck., an ebony fretboard, gold-plated hardware and pearloid button tuners. A tremolo and 22 fret neck version were also considered, but CBSâ€™s decision in 1984 to divest from Fender put paid to these variations. It was, as was the case with the Performer and Katana released around the same time, just too different for traditional Fender players to accept as a guitar truly worth their attention and was dropped with little or no fanfare in 1985. However, if we assess it on its own merits the story could have been quite different. The guitars werenâ€™t generally accepted by Fender fans, and as such are rare. However, examples occasionally come up for sale, usually in the Â£750-1200 range. I myself saw one on a recent trip to that haven for all things guitar, Denmark Street in London. The price tag said Â£ask, however, so prices remain unclear. I have 2 elites – both sunburst. Rosewood necks. Extemely good guitars – I cant use anything else. So good for all styles. And I dont like the Tele shape – would have liked a contoured body but the sounds are so good I can easily live with the Elite. I was lucky to stumble into the elite when I was looking for a new tele in 1984 It was different but won me with with its luxurious feel in finish, playability and the sound is somthing from heaven, with the mdx and tbx controls one is able to model many great and some incredablely sweet sounds via the active circuitry which is driven by a 12 volt battery,the pickups are lace senser not humbuckers as reported in some reveiws I have read,maybe they could be mistaken as humbuckers at first glance as they are quite wide compared to the narrower 1983 elite strat lace senser pups. My elite is an unusual irredecent blue going into gray fender call it blue burst,maple neck ,rosewood board chrome tuners what else can I say great. Great guitar this model! I was lucky enough to acquire a 1984 model last year (2009). I’m a bass player, so I use mine when writing and trying out songs rather than live (though I’ve done a couple of Billy Bragg-type gigs with it). Great control of sound, fitted with Ernie Ball slinky strings it is so good to play! And it looks superb – recognisable as a Tele, so usually attracts quite a lot of attention ‘co people can’t figure out quite what it is. A collectable investment it certainly is, but it demands to be played too! It was Tom Bailey of Thompson Twins who brought mt attention to the Tele Elite. Mine are 1 x gold hardware & pearl tuners with maple neck, 1 x chrome hardware with maple neck and 1 x rosewood neck and chrome hardware, all finished in black (I have 3 1982 Dan Smith Strats too). I’ve had a few different Teles and played lots more over the last 20 years and there’s no doubt in my mind these are by far the best Telecasters ever made, the construction, sound and playability of the them makes sure they deserve the name ELITE. I seem to use them more than even my favorite Les Paul although I will always be a Gibson man at heart. I’ve had mine for about 20 years (left handed, sunburst) and have only seen 1 other on eBay. I’ve nearly sold it a couple of times but I just can’t do it. It does everything I want and always gets attention at gigs. The only way I’d change it would be to have a rosewood neck instead of the maple one it has. Awesome player has never let me down.